Today’s many industries and economies are dramatically changing, fuelled by the development in emerging markets, innovation and sustainability policies. Moreover, Digitization and new business models have revolutionized every industry and automotive sector will be no exception. Emergence of autonomous vehicles and other innovative technologies could provide solutions to some of our most stubborn social problems—the high cost of traffic crashes and transportation infrastructure, traffic jams and to curb rising need for parking lots. The automotive industry is currently developing and providing sensor-based solutions to increase vehicle safety, known as Advanced Driver Assist Systems (ADAS), which uses a combination of advanced sensors, such as stereo cameras and long- and short-range RADAR, combined with actuators, control units, and integrating software, that enable cars to monitor and respond to their surrounding environment. Some of the ADAS solutions, such as lane-keeping and warning systems, adaptive cruise control, back-up alerts, and parking assistance, are now available in many high end car variants. Many others such as semi-autonomous and fully automation technologies are in the pipeline, which is likely to hit the roads by 2020. The report covers the present ground scenario and the future growth prospects of the autonomous vehicle market for 2016-2024 along with the total revenue of autonomous vehicles industry in every region. We calculated the market size and revenue share on the basis of revenue generated per segment, regional and country level. The revenue forecast is given on the basis of number of autonomous vehicles manufacturers and current growth rate of the market. 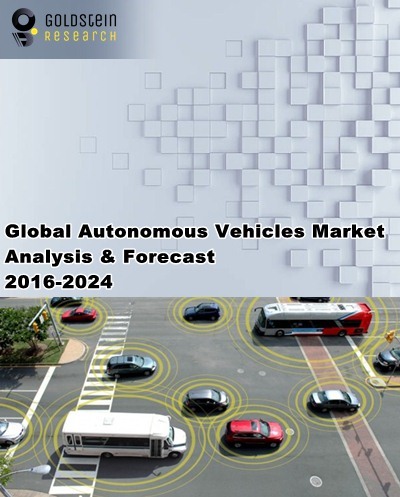 Autonomous Vehicle Market Report by Goldstein Research has been prepared based on an in-depth market analysis from industry experts. The report covers the competitive landscape and current position of major players in the global driverless/self-driving vehicles market. The report also includes porter’s five force model, SWOT analysis, company profiling, business strategies of market players and their business models. Global autonomous vehicles market report also recognizes value chain analysis to understand the cost differentiation to provide competitive advantage to the existing and new entry players. Our autonomous vehicle market report comprises of the following companies as the key players in the global autonomous vehicles market: Volkswagen Group, Tesla Motors, Daimler Group, Google Inc., Uber, BMW AG, Audi AG, General Motors, Volvo Group, Nissan Motor Company, Baidu Inc., Apple Inc., Ford Motor Company, Toyota Motor Corporation and Dutch Automated Vehicle Initiative (DAVI). Goldstein Research analyst forecast the global autonomous vehicles market to expand at a CAGR of +39% during the forecast period 2016-2024. The autonomous vehicles are anticipated to hit the roads by 2020 only, as most of the autonomous vehicle projects are in testing phase are facing many challenges related to government regulations and preset infrastructure. However, after the successful deployment of self-driving cars the automotive industry is likely witness more than 600,000 unit sales of autonomous cars. Geographically, North America region is anticipated to be the largest market for autonomous vehicles market as deployment of self-driving cars in the U.S. will begin with several thousand autonomous vehicles in 2020, which is expected to grow nearly 4.5 million vehicles by 2024. North America is projected to closely follow by the Western Europe with a little more than 3 million autonomous vehicles expected to be sold in 2024. Asia Pacific region is likely to be the most opportunistic market as the region is the biggest automotive market and will grow significantly with some automation level provided by the automobile manufacturers in their premium car segments. Based on technology, driver assistance and semi-autonomous passenger cars are expected to dominate the autonomous cars market across the globe. Research and development activities by the major automotive manufacturers such as Volkswagen and bosh to deploy the semi-autonomous cars by the end of 2020, will significantly boost the self-driving vehicles market growth in coming years. According to our global autonomous vehicles market study on the basis of extensive primary and secondary research, one major trend in the market is development of foundational technology and significant R&D announcements and collaboration projects. Many automotive OEMs and tech companies are in race to develop self-driving cars and the services such as ride-sharing that could expand exponentially with technology. In past few years, a number of automakers have announced investments and strategic partnerships with ride-sharing companies like Lyft, Uber, and China rival Didi Chuxing in order to take advantage of emerging technologies. According to the report, major driver in global autonomous vehicles market is growing investments by automotive companies and favorable government policies for faster development and deployment of autonomous vehicles. For instance, the new legislation in Germany allows the German car manufacturers to test their prototype autonomous vehicles on roads. Further, the report states that one challenge in global autonomous vehicles market is the data security and privacy. One of the major concerns among manufacturers and users is the data privacy and security breach as the autonomous vehicle is a subject that cannot be looked at without concerning the problem of data protection.